I’ve taken full advantage of grilling this summer. More so than I have in past years, and I’m grateful that I live in Florida because we can pretty much grill year round! But for those of you not as fortunate to have that luxury I figured I would squeeze in a few more grilling recipes to satisfy your summer taste buds! I’m also excited because I have a lovely Wholly Guacamole & Salsa giveaway. Back in March when I attended the Southeast Produce Conference I had the opportunity to try the brand new (not-in-stores-yet) fruit salsas! I couldn’t stop talking about them and was chomping on the bit to try them again. My mind was swirling with recipe ideas. These don’t have to be used just as salsa… you can incorporate them into a wide variety of dishes! One of my first ideas I had was to mix in the red pepper mango salsa into coucous! Adding tons of flavor with very little effort! Boy, was I right. Add some fresh herbs and a little salt and pepper to taste and you have a flavorful side dish in minutes. 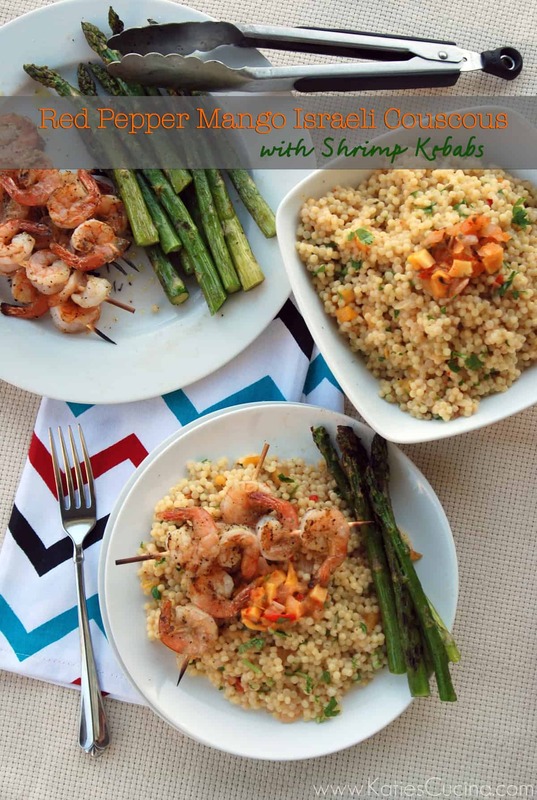 I paired it with grilled shrimp using my all-time favorite seasoning… Greek seasoning and some grilled asparagus. Perfect summer time meal made in less than 30 minutes! I had never grilled asparagus–like asparagus cooking directly on the grill–not in a foil pouch like a typically do until this year. Directly grilling the asparagus reminds me of roasting them in the oven. I must preface about the salsas. You still may not be able to locate it in your local grocery store. I’ve yet to see it in Florida–I know the Wholly Guac team is working on it, but I just wanted to give you the heads up since by now I’m sure your chomping at the bit to go run to the store to buy some. But don’t worry–you can enter for a chance to win a cooler prize pack that will be shipped directly to your door! Please wait for the rafflecopter widget to download and follow the prompts it ask. You must answer the mandatory question in order to qualify for the additional chances to win. *When you leave your comment if it doesn’t automatically appear do not leave another comment–it is because I need to approve your comment. I will contact the winner and they will have 3 days to respond–if they do not respond I will chose another winner via random.org. This giveaway is only open to USA residents and ends on 9/7/2012. In a large pot bring chicken broth and 1 tablespoon olive oil to a boil. Stir in couscous and simmer for 5 minutes (uncovered). Place lid on pot and and remove from heat. Let the couscous sit for 10 minutes. Once couscous is cooked and most of the liquid is absorbed stir in red pepper mango salsa and chopped parsley. Mix well, add salt to taste, and set aside until ready to plate. Preheat the grill to high heat. In a large bowl place shrimp,1 tablespoon of olive oil, and 1 tablespoon of Greek seasoning together, mix until seasoning has coated shrimp. Skewer shrimp on to kebab sticks. On a separate plate, place trimmed asparagus on plate and drizzle with olive oil. Sprinkle with salt and pepper to taste. Make sure all of the asparagus is coated in olive oil. Place the asparagus on the grill (high heat) fro 10 minutes flipping multiple times. Place the shrimp on medium heat for 5 minutes flipping twice, cook until opaque in color. To plate: spoon couscous on plate followed by grilled shrimp skewers on top. Garnish with Red Pepper Mango dip and place a generous serving of asparagus on the side. Enjoy! 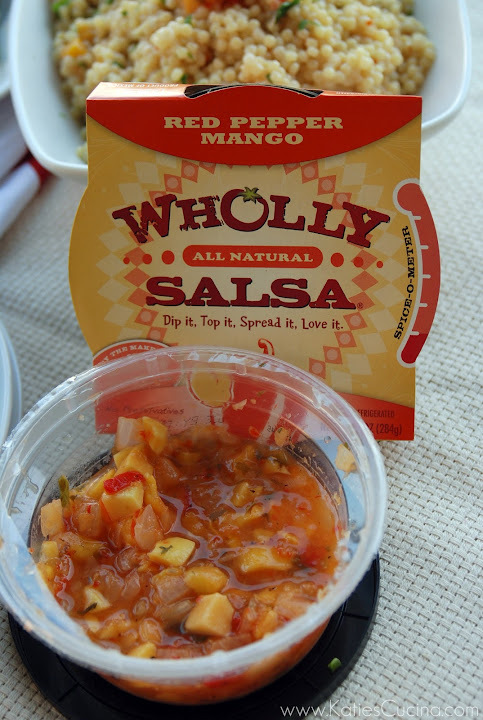 You can find Wholly Salsa Red Pepper Mango Dip in the refrigerated section (near the deli) of your local grocery store. Disclaimer: I received one cooler full of Wholly Guacamole & Salsa products. I was not compensated to write this post–I just love the product. 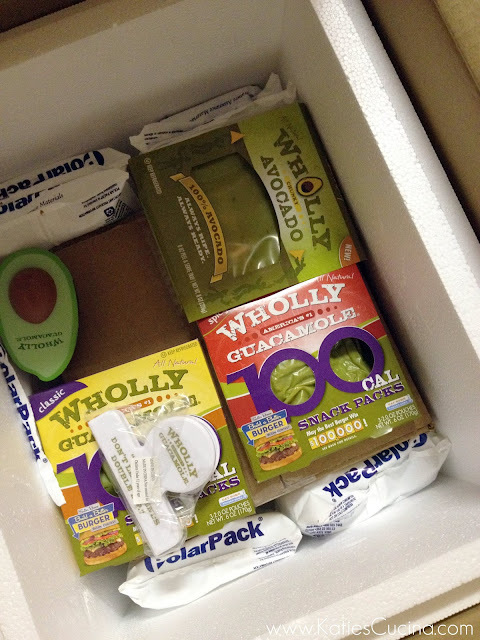 Wholly Guacamole is providing one reader with a cooler per giveaway rules & regulations. The couscous with the Red Pepper Mango dip looks amazing. I would love to try that salsa! Guacamole & Spicy Pico or Pineapple Salsa…yum! Guacamole & Spicy Pico sounds Delicious! I want to try the Wholly Guacamole spicy 100 calorie pack! I want to try the Red Pepper Mango Salsa. The Roasted Tomato Salsa sounds interesting. 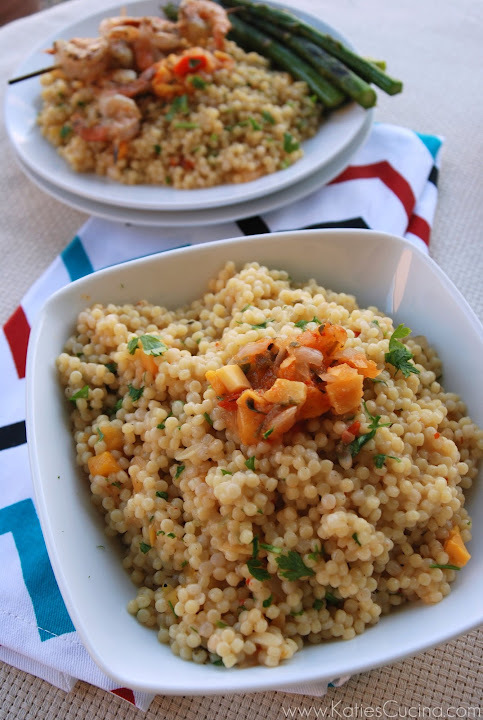 I love the idea of using salsa to dress couscous! So tasty! That would inspire a whole feast! I would love to try the pineapple salsa! What a pretty plate – love how you used the Wholly Salsa to brighten up this dish. I want to try the Red Pepper Mango Salsa. Love those mangoes! The 100 calori guacamole original snack packs would be awesome! I want to try to red pepper mango salsa!!!! with cous cous! your post made me hungry! Wow – Gorgeous pictures and a delicious recipe! My pick is the Pineapple Salsa! Thanks so much! I’d like to try the Red Pepper Mango Salsa. I love Wholly Guacamole’s 100 calorie packs. They’re so convenient for lunches. Those guacamole snack packs would be perfect from my lunches on the road! I love the 100-cal snack packs. I tried them at BlogHer and think they would be AWESOME for my kids lunches (and mine too).